Genome-scale metabolic network reconstructions are low level chemical representations of biological organisms. These models allow the system-level investigation of metabolic phenotypes using a variety of computational approaches. The link between a metabolic network model and an organisms’ higher-level behaviour is usually found using a constraint-based analysis approach, such as FBA (Flux Balance Analysis). However, the process of model reconstruction rarely proceeds without error. Often, considerable parts of a model cannot carry flux under any condition. This is termed model inconsistency and is caused by faulty topology and/or stoichiometry of the underlying reconstructed network. While there exist several automated gap-filling tools that may solve some of the inconsistencies, much of the work still needs to be carried out manually. The common “linear list” format of writing biochemical reactions makes it difficult to intuit what is at the root of the inconsistent behaviour. Unfortunately, we have frequently observed that model builders do not correct their models past the abilities of automated tools, leaving many widely used models significantly inconsistent. We have developed the software ModelExplorer, which main purpose is to fill this gap by providing an intuitive and visual framework that allows the user to explore and correct inconsistencies in genome-scale metabolic models. The software will automatically visualize metabolic networks as graphs with distinct separation and delineation of cellular compartments. ModelExplorer highlights reactions and species that are unable to carry flux (blocked), with several different consistency checking modes available. Our software also allows the automatic identification of neighbours and production pathways of any species or reaction. Additionally, the user may focus on any chosen inconsistent part of the model on its own. This facilitates a rapid and visual identification of reactions and species responsible for model inconsistencies. Finally, ModelExplorer lets the user freely edit, add or delete model elements, allowing straight-forward correction of discovered issues. 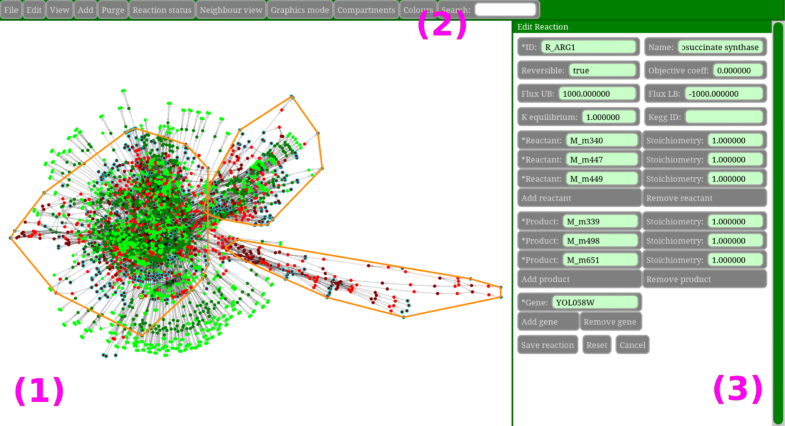 Overall, ModelExplorer is currently the fastest real-time metabolic network visualization program available. It implements several consistency checking algorithms, which in combination with its set of tracking tools, gives an efficient and systematic model-correction process. Genome-scale metabolic reconstructions have become a standard approach for the computational investigation of living organisms’ phenotypes , bridging the gap between experimental knowledge of components, such as which enzyme catalyzes which reaction, and high-level organismal behaviour (e.g. growth rate). In their simplest representation, genome-scale metabolic reconstructions only consist of chemical and transport reactions with corresponding reactants and products distributed into different compartments of an organism [2, 3]. In order to predict the growth rate of an organism from a genome-scale metabolic reconstruction, one usually applies a constraint-based modeling method such as Flux Balance Analysis (FBA). The FBA approach is based on a steady-state approximation of cellular growth. In FBA, an empirically acquired biomass function is optimized while the metabolic reconstructed network is subject to constraints on nutrient uptake reactions. Additional information may be included in the model either to further constrain it, as exemplified by the MOMENT method , or to expand its descriptive ability by, for instance, adding genetic regulation and protein expression explicitly as in ME models . While such approaches complicate the treatment of metabolic models even further, there still does not exist a reliable automatic, or even close to automatic, workflow to create the basal metabolic reconstruction. The draft of a high-quality genome-scale metabolic reconstruction is often created with automated tools, such as the SEED , or the RAVEN  toolboxes, that adhere to many of the proposed steps for generating a reconstruction . The starting point of this procedure is commonly the annotation of an organism’s genome, which is used to elucidate what enzymes are produced and which reactions the metabolism of an organism is capable of performing. A first benchmark test of a draft reconstruction, is the assessment of its ability to produce biomass (grow) given a certain medium composition. Sometimes the metabolic reconstruction, however, is incapable of producing all the constituents of the biomass reaction on the given medium, or even on any media. Additionally, even when a draft or a published reconstructed network is capable of producing all the constituents of the biomass reaction, it is still the rule rather than the exception that the network contains reactions which are blocked in FBA simulations under any input conditions. Apart from being useless in terms of modelling, if corrected and made active, such reactions could increase the model realism and quite possibly affect phenotype predictions, such as gene essentiality, by providing alternative pathways. These generally blocked reactions result from topological and stoichiometric issues intrinsic to the model itself. Therefore their presence is termed model inconsistency, and the search for such reactions is called consistency checking. The first-line tools in identifying and fixing the cause or causes for model inconsistencies are automatic gap-filling algorithms. These can either address all blocked reactions at once  or first divide them into groups called Unconnected Components, addressing each group one by one to reduce complexity . Unfortunately, these tools usually cannot solve all the inconsistencies. Take as an example the Gapfind/Gapfill approach of Kumar et al. : They find that up to 40% of the blocked fluxes in the E. coli model they were addressing could not be fixed using their algorithms, while for S. cerevisiae this number was 58%. This is a significant issue that must be fully acknowledged and appreciated. Existing tools are quite simply not enough. The problem is further complicated by the fact that model building and gap-filling tools may use the same metabolic reaction repositories, rendering gap-filling useless. When automatic tools fail, it is currently necessary to manually identify the cause, or often multiple causes, for the deficits. This is a tedious process, complicated by the linear list format of metabolic models. While it is quite straightforward to identify lists of blocked reactions, using e.g. existing functions in the COBRA toolbox  or in COBRApy  framework, it is often quite challenging to identify what the inconsistencies are caused by. Usually we are talking about a small set of reactions being at the root of the problem. We have for instance observed cases when a single faulty transport reaction caused a stoichiometric lock, that effectively incapacitated a whole compartment. The main purpose of ModelExplorer is to aid the user in correcting inconsistencies that cannot be addressed with automatic algorithms. The software provides a visual interface and multiple analysis modes to facilitate the identification of blocked reactions and in searching for and correcting the source of their inactivity. Based on our hands-on experience with manual curation of more than 10 genome-scale metabolic models, we have found that when significant parts of the metabolic network are shown to be inconsistent (for some reason, being blocked), the inconsistency can often be corrected by adding or modifying one, or very few (thus key) reactions in the network. Similarly, we identified the need for a visual workflow for model curation in order to speed up the process of fixing the large number of reactions that are not automatically corrected by current software. With ModelExplorer, the user can get an intuitive overview over every blocked part of the model, allowing the user to identify and fix key reactions which need to be corrected without leaving the software, as well as quickly identifying related, broken parts of the metabolic network. ModelExplorer has been developed as a stand-alone graphical application under Linux Additional file 1 and Windows Additional file 2 and is fully written in C ++ for speed and ease of interaction with the COIN-OR Clp linear programming library , which is used for model consistency checking. The software uses cgraph (the C library behind Graphviz) for making metabolic network layouts, and the Allegro 5.2 gaming library for graphics. To achieve smooth graphical output also for larger networks, it uses GPU-accelerated anti-aliasing. GPU acceleration also positively affects the frame rate when moving the network in the display panel. This does not mean that the software requires a dedicated graphics card, as all modern processors possess a graphics unit. In the Windows OS, graphics drivers are usually provided out of the box. When using Linux, it is recommended to use a standalone installation of Linux (preferably Ubuntu 16.04 to 18.04) with appropriate graphics drivers enabled in order to ensure that the ModelExplorer graphics are rendered fast and smoothly. Virtual machines often do not provide direct access to the GPU. The software will take a reconstructed metabolic network in the sbml format [14, 15] as a file input. The number and complexity of genome-scale metabolic reconstructions continues to grow. For microbial reconstructed M-models, the number of reactions is in the low thousands, while microbial community reconstructions consist of tens to hundreds of thousand reactions. ModelExplorer provides the user with the ability to evaluate model quality and aids in correcting inconsistencies in models provided in the common SBML format. The visual nature of the software’s different functions makes it intuitive and easy to use, while its reliance on low level routines makes it faster than existing metabolic model visualization software. Operating systems: Windows 8.1 and 10, Linux - Ubuntu 16.04 LTS, 17.04, 17.10, 18.04 LTS and Manjaro 17.1.1. Any restrictions to use by non-academics: license needed for commercial use. The authors would especially like to thank C. Schulz for feedback and testing of the software. MN and EA would like to thank The Research Council of Norway (RCN) grant 245160 (ERASysAPP: WineSys) for funding. The funders had no role in study design, data collection and analysis, decision to publish, or preparation of the manuscript. The ModelExplorer, is freely accessible and can be downloaded without user registration at https://www.ntnu.edu/almaaslab/downloads. MN and EA conceived of the project. MN implemented the software. MN and EA wrote the paper and approve of the final version. Bastian M, Heymann S, Jacomy M. Gephi: An open source software for exploring and manipulating networks. 2009. International AAAI Conference on Weblogs and Social Media. http://www.aaai.org/ocs/index.php/ICWSM/09/paper/view/154. Gurobi Optimizer Reference Manual. http://www.gurobi.com. Accessed 1 Aug 2018.